I think we have a surplus of potatoes in my household. But the ideas for how to switch up the different ways to eat them keep flowing! This time my mother dug deep into her subconscious to a vague memory of her mother Jo making leftover Mashed Potato Patties. Around the 50's when money was scarce, women found ways to save their leftovers from waste and sometimes stale taste. This old fashion Italian twist revitalizes the mashed potatoes and creates an entirely new dish for your next meal. 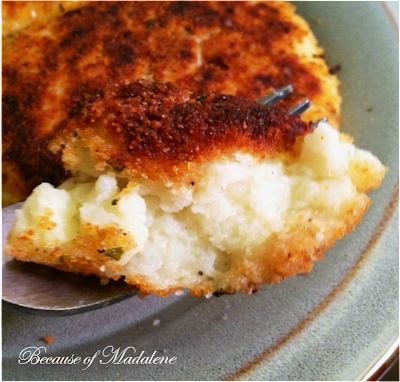 So the next time you find yourself having leftover mashed potatoes, don't eat them twice... turn them into breaded patties instead! In a dish, combine the bread crumbs, salt, pepper and some parmesan cheese together. I usually use about a handful of cheese. In a separate bowl, mix 1 egg into your leftover mashed potatoes (this creates a bind so they stick together). Form 2 in. mashed potato balls and place into the bread crumb mixture. Press the ball down to form a flatter patty shape. Carefully flip over the patty and coat the other side with the bread crumbs. Over medium heat, in a pan filled with a thin layer of olive oil (these are not deep fried, you just want to brown the bread crumbs), place in the patties. After about 5 mins. or until their brown, flip them over and cook for another 5 mins. or so. Serve them hot with ketchup or salsa! Eat them for breakfast or as a dinner side.